Too much, too little, too polluted, too expensive, or not expensive enough — planners and water managers sat down together in Kansas City September 11–12, 2018 to discuss these water-related issues and foster greater collaboration between our professions for the betterment of our communities. 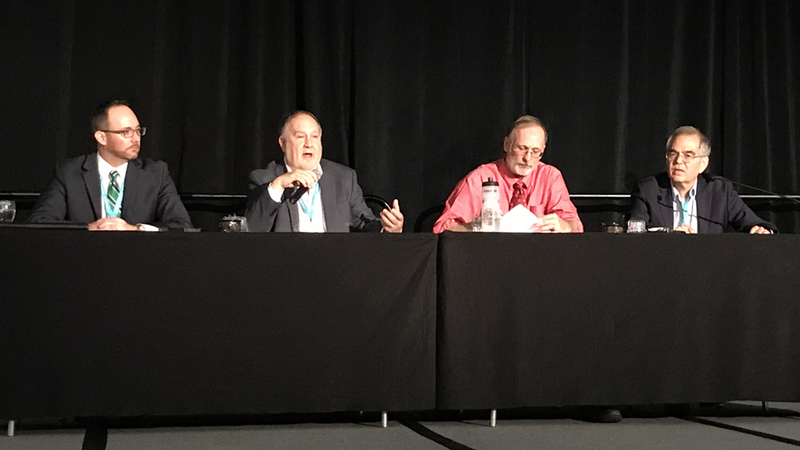 Water and Planning Connect, a first-of-its-kind APA specialty conference, brought together planners and water professionals from across the United States as the first step in building a stronger foundation between the professions, working toward a common goal. Paul R. Brown, AICP, kicked off Day 1 with his keynote address, “Courageous Planning: Helping Water Managers Cope with Extreme Events,” in which he explained the end of climatic stationarity and the ways in which planners, engineers, and policymakers can make decisions on the management of water supplies, demands, and risks in the face of extreme uncertainty. On Day 2, Doug Farr shared his belief that all planners have superpowers, one of which is to see what others can’t, in his keynote “Sustainable Nation: Developing Superpowers for Water Planning and Implementation.” He explained how to leverage this power to see the invisible structures that block the best-intentioned water-related plans from becoming reality, and how to speed up the implementation of innovative and sustainable water-based planning and management. Attendees spent most of Tuesday in breakout sessions that addressed building skill alignment between planners and water resource professionals, innovative state water management frameworks, the impacts of climate change on water resources, and addressing water equity challenges. One of the most crowded sessions, “Plans, Codes, and Water,” laid out an integrated approach to the protection, provision, and management of water resources and infrastructure by local jurisdictions, from long-range planning to plan implementation through effective codes and ordinances. On Wednesday morning, attendees chose between sessions on best practices for on-site water reuse at the building and district scales, tools and techniques that water utilities have used to conduct outreach and community engagement around water projects, regional- and watershed-scale planning efforts, an overview of water-related decision support tools that planners and water resource professionals can use to inform their work. One Water was a recurring theme of the conference, with sessions that explored the federal, state, and local policy implications of the One Water concept, as well as innovative One Water case studies and an overview of green infrastructure as it pertains to the One Water framework. The Lincoln Institute of Land Policy led a two-part scenario planning workshop that focused on the value of scenario planning for addressing land use impacts on water resources and provided an interactive demonstration of exploratory scenario planning. Equity was another recurring topic, connecting to APA's principle of ensuring that our communities are prepared, sustainable, and just. Addressing Water Equity Challenges provided a framework for understanding and addressing water equity challenges, while Financing Equitable Water Infrastructure Systems focused on strategies cities and regions are exploring to repurpose and leverage public and private funds to address water challenges in ways that benefit disinvested communities. Join the more than 400 members of APA’s Water and Planning Network to stay up to date on people, work, and events that bridge the gap between professionals working in the water world. The Water and Planning Network operates as a communications and information sharing network to connect members to the best planning practices that reflect current research, science, policy, and technology regarding the protection, management, and use of water resources and utilities. Top image: Anne Miller, AICP, of the Colorado Department of Local Affairs presented on Colorado's state water framework at Water and Planning Connect. Photo by Jennifer Henagahan. Jennifer Henaghan is APA's deputy director of research.